During the Great Recession and the years following, the Federal Deposit Insurance Corporation (FDIC) closed 465 failed banks. But even in the last few years, at least five to ten banks close per year. If you have a credit card from one of these banks, what happens when your credit card company shuts down? Like all businesses, banks and credit card companies have to make money to keep operating. Even small card issuers require staff, offices, and computer systems to keep things up and running. But when the profits don’t add up, they can’t keep the lights turned on. The Great Recession of 2007 and 2008 led to the closures of a massive number of banks and impacted a huge number of Americans. I saw one bank where I had a CD account go under, and got a check from the FDIC for my funds. But that is what happens for checking, savings, and other bank accounts, not credit cards. In the Great Recession, the source of banking losses ultimately boiled down to poor real estate lending practices and poor risk management for large investments in pools of mortgages. The United States averages 5 to 8 bank closures per year since that time, but that figure does not include nonbank lenders, which may include credit card issuers. When a bank or other financial company does shut down, it may not bring all accounts with it, however. There is a good chance the accounts will live on at a new bank or financial institution. That is why it is very important to watch your email and snail mail for any notices or information regarding your account at a closed credit card issuer. 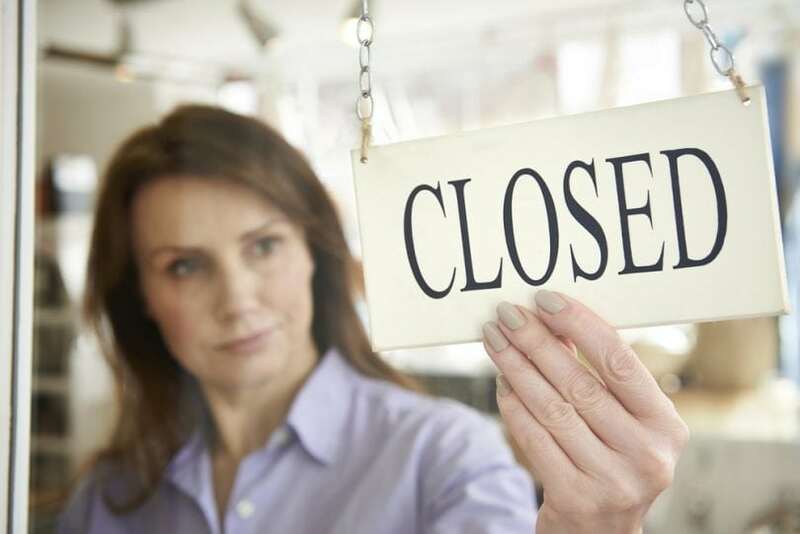 There are a few different situations where you may find a business closing impacts your credit. Those are when a bank closes, a nonbank credit card issuer closes, or a store closes where you have a store credit card. First, let’s look at what does not happen when a card issuer closes: your debt does not go away. Even if the company closes, you still have to pay your credit card balances off completely. You may be paying someone else, but you don’t get out of paying. Sorry for the bad news! In some cases, your credit card account won’t change much at all. It could transfer to a new bank or issuer, who you will pay going forward, but otherwise you can keep the account and card. In some cases, the company that purchased your account may convert the account to one of their accounts, or a generic credit card that they offer. If this is the case, be sure to look at any changes in rewards, fees, rates, and other changes. In the worst case, your account will be closed. Once you pay it off, in that case, you are done with it and don’t have to worry about it any longer. Just don’t forget about paying or let that debt sit there. You could cause serious harm to your credit report and credit score if you neglect paying off any debt, even from a credit card issuer that when out of business. If you do have a card issuer close and it ends up closing your account, it may lower your credit score. That is one of the only times your score can go down because of something beyond your control. But lucky for you, there is a lot more you can control in your credit than you can’t. Keep accounts open – If you do have credit accounts without an annual fee, keep them open even if you don’t use them. This improves your average age of open accounts and improves your credit score over time. Avoid opening and closing too many accounts – Opening accounts, like closing them, temporarily hurts your credit score. Avoid opening or closing too many accounts if you want your credit score to increase. If you plan to buy a home or car with a loan in the next six months or so, avoid opening and closing new credit accounts until you have that loan setup and in place. Always pay on-time – Your on-time payment history is the biggest factor in your credit score. A late payment hurts your credit for up to seven years. Always pay on time to avoid this, even on closed accounts from old creditors. Pay off revolving credit – If you have any credit cards or lines of credit, paying them off to a zero balance is the best option for a high credit score. It also helps you avoid paying expensive monthly interest charges. Particularly if you have a bank close, but in any case, you should always do everything you can to pay off your cards in full every month. Your credit score is too important to ignore, and a credit card company closing is a good reminder and opportunity to check your credit report and credit score while building a long-term plan to keep your credit score as high as possible. While a company going out of business and closing or changing your credit card may have a slight negative impact on your credit, as long as you pay the card off in full it shouldn’t cause you too much credit strain over time. As with every credit decision, focus on the long-term. While you can destroy a perfect credit score quickly, it takes years to build one. By always paying on-time, keeping balance low, and making smart and educated credit decisions, you have little to worry about, even if your credit card company goes out of business.